Santa Rosa, Calif.—Sonoma County Winegrowers announced today that more than half of all vineyard acres in Sonoma County have completed a sustainability self-assessment after just 15 months since the organization announced its bold commitment to become the nation’s first 100% sustainable wine region by 2019. This early success exceeds expectations indicating the strong commitment by Sonoma County’s multigenerational winegrowers. In January, the Sonoma County Winegrowers released their First Annual Sonoma County Sustainability Report. This comprehensive, 24-page report details their viticulture and winemaking practices, and documents the county’s progress. At the time of reporting, 43% of the vineyard acreage was self-assessed, with 33% certified by a third party auditor. With today’s announcement, sustainability assessments have increased to 58%, representing roughly 34,346 acres. These newly assessed acres are currently in the process of third party certification. Sustainable farming and continuous improvement reflects the values of Sonoma County and its landscape of multi-generational family farmers and businesses. There are 59,218 acres planted to vineyards, which accounts for only 6% of Sonoma County’s total acreage. 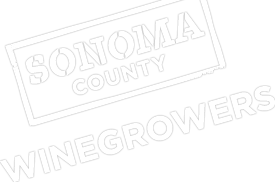 Sonoma County is comprised of many small farms with more than 40% of Sonoma County’s vineyard parcels less than 20 acres in size, and 80% of the county’s vineyards less than 100 acres. To support their sustainability efforts, the Sonoma County Winegrowers launched a national advertising and promotional campaign to explain their commitment and educate the public on what their sustainability practices mean for grape growing and better wine quality. These ads have appeared in a various food, lifestyle, and consumer wine magazines. Additionally, they have partnered with influential sommeliers to help educate them about their vineyard practices and start a dialogue on the positive impact of sustainable agriculture inside the bottle. The organization has also been recognized throughout the world for its efforts and has been invited to speak at some prestigious industry events and national sustainability forums, including Wharton’s upcoming Initiative for Global Environmental Leadership (IGEL) 8th Annual Conference on “Business Takes the Lead: How Innovation Will Drive Our Mitigation and Adaptation to Climate Change” and the Monterey Bay Aquarium’s Sustainable Foods Institute. As a natural extension to its sustainability commitment, the Sonoma County Winegrowers unveiled a 100-Year Business Plan to preserve agriculture in Sonoma County well into the 22nd Century. The 100-year plan is believed to be the first of its kind in agriculture and the global wine industry. It is also the next step in the evolution of Sonoma County’s efforts to become the first wine region in the United States to have all of their wines grown and made in a sustainable manner. Sonoma County has some of the world’s most prized grape growing areas in the world with the first vineyards dating back to the 1820s. The region’s unique combination of rich geological history, fog patterns generated by its 70-mile Pacific Ocean coastline, and topography has given rise to 17 unique American Viticultural Areas (AVA). Each AVA offers distinct climate, soils and temperature areas perfect for growing world-class Pinot Noir, Chardonnay, Cabernet Sauvignon, Zinfandel and more. Sonoma County is also home to around 500 wineries whose wines are renowned throughout the world. In a recently released report, Sonoma County’s wine industry brought an economic impact of $13.4 billion in 2012. This includes providing 54,297 full-time equivalent jobs, directly and indirectly, from winegrowing and winemaking in Sonoma County.